Tuna is the most widely consumed fish species in the world. Tuna fish live a very long life and tend to be nomadic. The tuna we consume is mostly caught in the temperate waters of the Atlantic Ocean. Tuna is also caught in the waters off the coasts of Japan, Australia, and the Mediterranean region. What is so unique about tuna is the red color of the flesh. It resembles beef. It is also a very sturdy fish when cooked. Raw tuna is a little more delicate and has a silky feel in the mouth, making it extremely popular when eaten as sushi and sashimi. The flavor of fresh tuna is somewhat mild. For this reason, it lends itself to being paired with strong condiments and spices like soy sauce, wasabi horseradish, ginger, and pickled vegetables. There is a science, or a rule, to cooking fresh tuna properly. It is quite simple: Tuna should not be overcooked. When it resembles chunky, canned tuna that we use to make tuna salad sandwiches it is overcooked and will be dry. If you can find really fresh, sushi grade tuna at your market or fish monger’s shop, buy it and cook it that day. The best way to cook tuna is to flash grill it on high heat for a few seconds. A Foreman Grill steps up to the plate for this challenge. There is nothing complicated about grilling tuna steaks. It is quite simple and the recipe doesn’t need to be anything more that what is described here. Grilled tuna is often served over fresh salad greens. We are going to pair this recipe with a slightly sweet pickled cucumber salad. Make the salad recipe first and chill it in the refrigerator. You have the option of grilling the tuna for just 1 minute on a closed Foreman Grill. Or, you can grill this on an open indoor/outdoor grill by grilling it for 1 minute on one side, then flipping it and grilling for 30 seconds on the other side. What you are looking to achieve is pink in the middle with a gray exterior and grill marks. It needs to be noted that raw fish may not be recommended for persons with certain health conditions or for women who are pregnant. If that is the case, cook the tuna through. 1. Turn your grill on high heat. 2. Brush the tuna steaks with EVOO and season with salt and pepper. 3. Grill with the top closed for 1 minute. Allow tuna to rest a few minutes before slicing. 4. Slice tuna into thin strips to serve with a salad. Whisk together the vinegar, honey, dill, and salt in a large bowl. Add the cucumbers and onions. Chill for at least 15 minutes or longer. You might want to boil some small, whole, new potatoes to serve with this. Just add them to the plate with a sprinkling of salt. Or, consider making a Salad Nicoise using the grilled tuna. This is a classic French recipe that always calls for tuna. Try this one from Simply Recipes. You can grill the tuna in advance to have on hand. Is Tuna Good for You? There has been a lot of talk about mercury levels in fish. Tuna is a really good source of nutrients. However, it is recommended that you consume approximately 12 ounces per week, rather than having it at every meal. Given the cost of fresh tuna, this is probably not going to be something you consume daily. As with all fish, wild or pole caught is going to be the cleanest. Tuna is a very lean protein. A 6 ounce tuna steak will provide you with approximately 50 grams of protein. 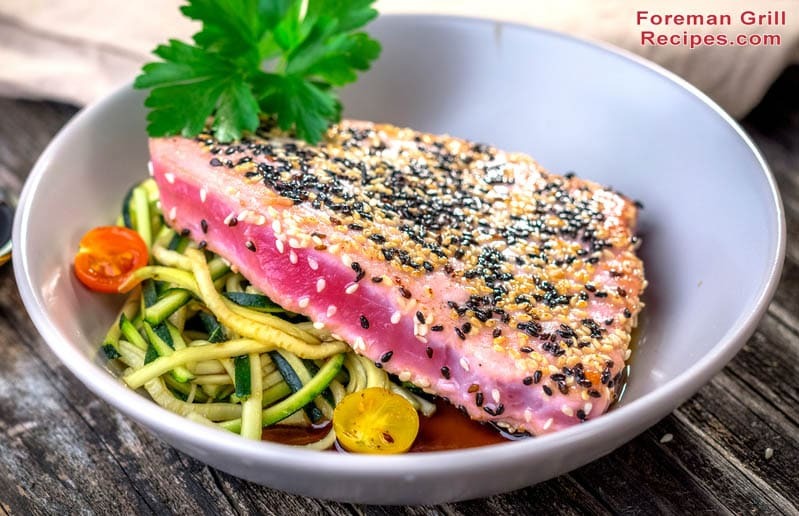 Tuna contains significantly less fat and cholesterol than red meat, making it a better choice when thinking about your cardiovascular health. This fish is high in omega-3 fatty acids. A diet rich in omega 3s has been shown to help prevent high blood pressure, increased cholesterol levels, cancer, rheumatoid arthritis, osteoporosis, and Alzheimer’s disease. Tuna is also a good source of vitamins and minerals. Tuna is likely the easiest fish to prepare on a Foreman Grill. It is firm, delicious, and a great source of lean protein. When shopping for fresh tuna to grill, look for wild caught sustainably sourced fish. Don’t be afraid to ask how fresh the fish is and if it was previously frozen. If it smells fishy it is not fresh. Grilled tuna and salad is a classic combination, making this a perfect summer meal out on the patio.